Title: What is Software Testing? Buy at: Amazon, iTunes and other leading eBook retailers. AND with fantastic examples and humour to make your learning easy. Are you finding the ISTQB Foundation Syllabus difficult to read and understand? Then we think this is the book that will help you. We’ve spent alot of time and thought going through the Syllabus and distilling it into it’s key concepts and lessons, so why waste your time and energy when you can get this easy to read book for a great price. Embarking on a testing career or looking to freshen your understanding on key concepts and learn some cool tricks? This short book has been written as a companion guide for those who are an embarking on a testing career and for those that have been in the IT industry for a while but are looking to freshen up their understanding of the basic concepts and learn some cool tricks to make their testing more efficient. We believe that everyone is a tester so with that thought we believe that anyone in the IT industry will find this as a valuable reference point for improving the product quality of their software. Many people think that testing is just about finding bugs, and maybe about giving developers’ headaches (those poor developers). But as we’ve mentioned before, there’s much more to testing than uncovering those creepy-crawlies. Read more. This book’s content is based on the ISTQB Foundation Certification. 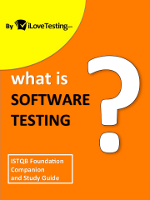 The ISTQB Foundation Certification is an international certification standard for software testers. If you are studying for the ISTQB Foundation Certification Exam we believe this book will help you pick up on the basic concepts far easier than if you tried to read the ISTQB Foundation Syllabus on its own. Buy now at: Amazon, iTunes and other leading eBook retailers.